The 2nd planet from the Sun, Venus is of similar size and mass to Earth. The similarity stops there, however. It is the hottest planet in the solar system, with a powerful greenhouse effect sustaining a scorching mean surface temperature of +470°C. Venus rotates very slowly, in the opposite direction to most planets. Its rotation is so slow that 2 days correspond to almost a whole year on Earth: the day cycle is 116.75 Earth days and the planet completes a full revolution around the Sun in 224.7 Earth days. 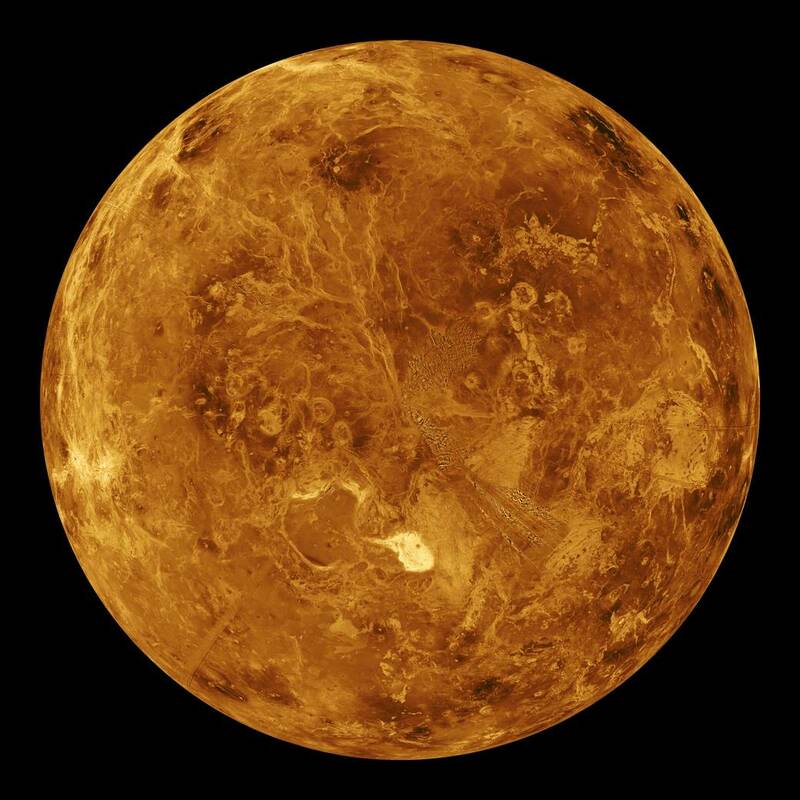 Venus’ iron and nickel core is thought to consist of a solid inner core probably surrounded by a liquid outer core. But the lack of an internal magnetic field rather suggests that the core could be completely liquid. The mantle is made up of silicate rocks and oxides and is believed to extend for half of the planet’s radius. Above the mantle is a thin silicate crust believed to be about 20 km thick. While plains cover 70% of the surface, other parts nevertheless reveal a turbulent past, with long and deep troughs, mountains up to 10 km high, volcanic domes and lava flows, and meteorite impact craters. Venus’ thick atmosphere consists essentially of carbon dioxide and the pressure is 92 times higher than Earth’s. This pressure generates a powerful greenhouse effect, which explains the high surface temperatures. The atmosphere circles the planet at high speed and in a retrograde direction, causing winds to blow at more than 360 km/h at altitude above the equator. From 32 to 90 km above the surface, clouds of sulphuric acid droplets and crystals block out 80% of the sunlight. Credits: Copyright 2000 by Calvin J. Hamilton. Venus Express was Europe’s 1st mission to Venus, designed to observe the planet’s ionosphere, upper and lower atmosphere, and surface. CNES provided technical support for some of the probe’s instruments developed by French research laboratories. It also accompanied their teams throughout the data-collection and exploitation phase. Venus Express ceased transmitting on 28 November 2014 after using up all of its propellant.